Inder Loves Folk Art: Autumn. What is all this talk in blog-land about being excited for the arrival of autumn? Fall colors, brisk fall breezes, wool, cardigans, boots, yada yada yada. My feed reader is practically exploding with posts written by folks who are yearning for cooler days and warmer, earth-toned clothing. These posts are often accompanied by photos of colorful foliage, chic camel coats, or cozy slippers. Oh, wait, you probably got a real summer, huh? Possibly with record-breaking heat and drought, or humidity and mosquitoes? Well, okay. But some of us only emerged from the fog last week. Some of us wear wool cardigans, boots (and hey, earth-tones) all year 'round. Some of us only noticed last month on a trip to Denver that we don't own a single tank top. Because, seriously, why bother. Some of us are still hoping against hope for some glorious warm days and ripe garden tomatoes. All of this autumn-talk may be preventing "some of us" (cough cough) from maintaining the proper level of denial. 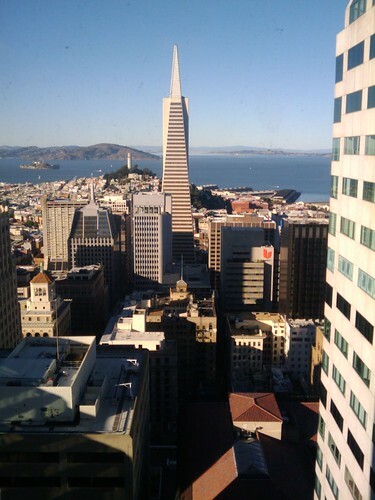 View from my office conference room on a gorgeous day last November. There is hope! Oh dear... our summers are generally of the cripes-it's-hot variety and I'd happily swap. Can I ask, all these autumn-lovin' bloggers are going on about making apple sauce at the moment, too. What do people use all these massive quantities of apple sauce for? It seems like a lovely idea but all I know of apple sauce for is as a condiment with roast pork. Can you enlighten a confused Aussie? Ha! Um, I might not be the person to ask. To me, apple sauce is baby food (children do like it). Or, like you say, an occasional sauce ingredient. Not something I eat a lot of. When our housemate gets lots of apples, she makes apple butter, which we eat on toast with butter or with peanut butter. Yum. As far as summer, I should probably just stop whining and be grateful I don't have to slog through the snow all winter. Sigh. Okay, so the apple sauce remains a mystery! We don't 'do' apple butter here either but the idea of it sounds a bit more... useful? Like a jam I guess. Snow looks really pretty to me but I reckon after about two or three days I'd be totally over it! Warm weather is coming on here and one of the first delights is the chook yard fills up with flies. Yuk! And something seems to have died in our shed, which is probably not helping. Want a hot summer now? Apple butter is a really delicious jam. I think maybe apple sauce is used more (eaten more) on the East Coast? It's more of a tradition there. Snow is almost as mysterious here as it is where you are, it sounds (in the winter, we can drive four hours to the mountains to play in the snow, but it never snows here - frosts are rare). Okay, your shed situation sounds very unpleasant.